Biobanking is not a new idea. It’s been around for decades. However, the arrival of more powerful informatics technologies has taken the idea of biobanking to new levels. Where a couple dozen or a couple hundred samples may have constituted a respectable biobank back in the ’80s, researchers now recognize that in order to get a handle on complex illnesses, it is necessary to access thousands and thousands of specimens, and perhaps thousands of megabytes of data for each specimen. That challenge requires advanced tools as well as advanced understanding. The biobank is the interface at which the public interacts with pure research, and where, therefore, concerns of privacy and ethics interact with the tools of high-throughput screening and automation. Questions of ethics and informed consent will top the docket at IQPC’s upcoming “Biobanking” conference. Experts from a number of leading biorepositories will speak about how their organizations are handling the deluge of patients and data in the modern biobanking movement. Hakon Hakonarson, M.D., Ph.D., director of the center for applied genomics at the Children’s Hospital of Philadelphia (CHOP) at the University of Pennsylvania is actively involved with the hospital’s biobanking initiative. The bank will ultimately contain blood samples from 150,000 individuals, mainly children. Dr. Hakonarson’s presentation will explore some of the complexities of obtaining and curating the samples, as well as the issues of privacy and intellectual property that go with them. CHOP is an active health center that serves over one million children annually in the Philadelphia area, says Dr. Hakonarson. When healthcare workers collect the samples, they enter phenotypic information into an electronic record system. A completed questionnaire accompanies the samples to the bank, where they are genotyped using high-throughput SNP genotyping systems from Illumina and Affymetrix in an automated workflow, he explains. Integration of the patients’ health information with genotype information from a blood sample provides a huge quantity of information for research studies. Ongoing projects that make use of the CHOP biobank include studies in the areas of ADHD, asthma, autism, cancer, Crohn disease, schizophrenia, type 1 diabetes, and neurodevelopment. Dr. Hakonarson says that the group has also created new cell lines to study the effects of the mutations identified by the genotyping studies, and his group has published over 100 papers in the last three years. “We’ve made significant progress in discovering ge.netic risk factors for complex pediatric disorders,” he says. CHOP has addressed ethical conundrums by anonymizing samples using a barcoding system and powerful encryption algorithm so that none of the samples are identifiable. Recruitment rates have been high. “These biobanks, if done correctly, are an extremely valuable source of information. People’s willingness to participate and donate samples as volunteers is a key issue. If set up correctly, it is highly secure and a tremendous resource for any therapeutic diagnostic development,” Dr. Hakonarson assures. Obtaining informed consent to collect samples for a biobank can be challenging. Walter Stewart, M.D., director, Center for Health Research and associate chief research officer at Geisinger Health System, will speak about the method his institute developed for achieving a high rate of participation. Typically, biobanks solicit samples from volunteers, and those volunteers have to be brought in for a blood draw. However, because Geisinger as a health system has its own patient population, setting up an automatic protocol was more straightforward. Once consent is given, a lab slip is placed in the patient’s file and used the next time there is a medical need for a blood draw. At that time, an additional two tubes are added to the draw and barcoded for the biobank. This automatic method of sample collection garnered Dr. Stewart’s team an 85% participation rate. “We didn’t have to pay for it except for cost of tubes. The system picks up from 40 clinics,” says Dr. Stewart. The conventional method of collecting samples costs $100–$200 per person, and then the biobank incurs added costs from following that individual over time. Within the Geisinger system, medical records are linked to samples so that the information is readily available. Dr. Stewart is also involved in developing a method for using leftover blood samples with the help of database-tracking systems by an IRB-approved data broker. In addition, he speaks of using an interactive video system for obtaining consent from sample volunteers. According to Dr. Stewart, this will remove inconsistencies from the consent process that are otherwise introduced by the varying manners in which healthcare providers choose to present the material. It can be difficult to locate and track quality samples within a biobank for a genomics study. Informatics technologies like virtual biobanks can make it easier to manage and share tissues. 5AM Solutions’ Biolocator software is an open-source solution to connect biobanks and researchers around the world, says Brent Gendleman, president and CEO. The company was contracted by the State of Arizona to create a virtual repository for hospitals to deposit their inventory of data. Researchers could then review the inventory online, and take that information into consideration in writing their proposals, knowing exactly what samples are available and at what cost. Once requests for tissue are approved, the tissues themselves are tracked so that information about how it is being used in various research projects is available in the virtual record. The virtual biobank turns the biorepository model on its head. Instead of having samples archived at some central location, a virtual biobank can track samples at an unlimited number of locations. The samples never have to be moved or handled until they are needed. Some other biobank ideas have been based on centralized storage and processing, but these initiatives have not been popular with researchers or tissue banks, who tend to like keeping their samples close. By letting people share samples that they physically never let go of, a biobank lets scientists have their cake and eat it, too. 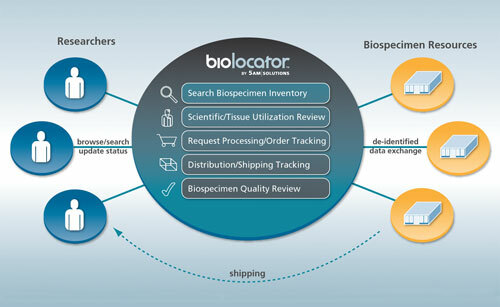 5AM Solutions’ Biolocator software unites biobanks with researchers seeking tissue. Rare-disease research benefits tremendously from large-scale biorepositories. Research institutions must cooperate in order to develop networks among biobanks. However, governance, ownership, and ethical standards must be developed before large-scale biobanking can succeed. Liz Horn, Ph.D., director at Genetic Alliance, breaks down some of the issues of adapting a large-scale biorepository to the smaller and sometimes obscure realm of rare-disease research projects. Genetic Alliance provides the infrastructure that allows patient advocacy groups to carry out research studies, says Dr. Horn. The Genetic Alliance Registry and BioBank is a centralized sample repository with clinical-data registry. It was founded in 2003 with the intent of providing infrastructure and customized solutions for disease advocacy organizations. In very rare diseases, where there’s little research interest, this approach is a realistic way to develop a sample collection and a cohort. The disease group owns its own samples, and Genetic Alliance guides them in building the collection. These nontraditional research initiatives can be very important to the scientific community, and even if originated by nonscientists, the resources gathered can generate interest among scientists. Sample collections include those for psoriasis, chronic fatigue syndrome, pseudoxanthoma elasticum, Joubert syndrome, hereditary angioedema, and inflammatory breast cancer. Joseph Mintzer, executive vp and chief operating officer at Coriell Institute, describes his organization’s ongoing work toward integrating large numbers of patient samples with large quantities of associated data to create a resource that serves both the scientific community and the health of the public at large. Coriell’s Personalized Medicine Collaborative is a long-term research study to determine the utility of personal genomic information in health management and clinical decision-making. The project provides data for research studies that discover unknown gene variants that are relevant to human health. It also includes functionality to provide actionable information back to study participants. The actionability of genomic screening data is a major bugaboo of many mass screening studies. Having information about a possibly harmful genetic mutation can be distressing and when there is no treatment, it is not considered to be in the best interests of patients. Some biorepositories manage this conflict by anonymizing data to the point that it is never reported back to the patient, but that deprives the patient of certain actionable information. Coriell’s model reconciles those needs, Mintzer claims. The model also incorporates long-term tracking of the sample donor, so that information can be added to the record. “Longitudinally based collection of biomaterials is associated with longitudinally collected data points that are clinical data points, now tied together with a future of maybe five or ten more years of those longitudially collected specimens as well as data points,” says Mintzer. Using the biobank data resource, scientists are able to look at the effects of environment, lifestyle, and chronic disease and compare that against genomic information. Mintzer says that projects are being operated out of Coriell in the areas of cancer, neuroscience, and cardiovascular disease. 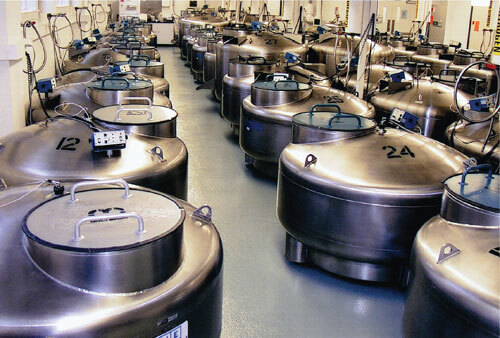 The cryogenic storage tanks in Coriell Institute’s biobank contain millions of vials of cells that are frozen in liquid nitrogen.